Home | Developing A Presentation/Speech | Chris Cebollero Interviews Me For . . .
Well, first of all accept that you’re going to have that fear and you don’t want to get rid of it completely. What you want to do is take that fear and put that energy into your presentation. A presentation without energy is boring. Absolutely boring. A couple of other things. My silver nugget for lessening the fear of public speaking and becoming a better speaker is practice, practice, practice. As much as you can. And the golden nugget is speak, speak, speak. The learning is in the doing and that’s why, and I’m sure you do the same, I’ll take some presentations, speaking opportunities where I don’t get paid or maybe I’ll get paid much, but every time I speak I learn something. That’s why I teach the class. It’s a nominal amount. I get some great stories. The more you do it, the better you get. The learning is in the doing. Yeh, most definitely. And one of the things that I found out is even when you teach it, see one do one teach one, which is an old practice. 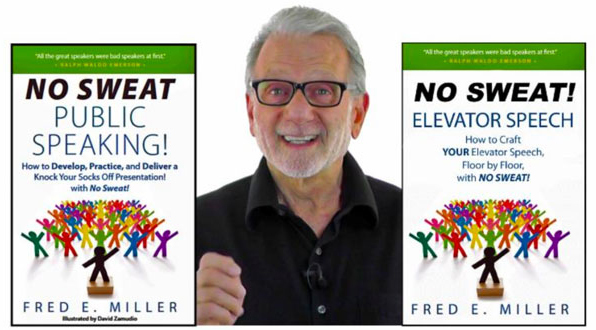 One of the things that I realized, Fred, is a lot of times when you teach it to different people, you’re not teaching it the same way. You know, one of the things that I talk about, you know, I do a lot of work with folks as well and get them ready for their presentations. And I try to get them to give the message different ways. Cause we talked about the adult learner and you know, whether it’s through visual, whether it’s through auditory, whether it’s through Kinesthetics, we’ve gotta be able to find the ways to help those individual adult learners grasp the material that we’re trying to give them. So in the see one, do one teach one, if you’re teaching it multiple times, try to change the message to deliver the same content in a different way. And I also talk about, you know, when people want to debate. One of the things that I think is important in debate is you need to know both sides of the argument. And this gives you the opportunity to say, I know exactly what they’re going to say, I know how they’re going to combat it, but we don’t want to deliver the same way all the time because we’ve got to think about the people that we’re delivering to. But I think you’re right on point with that, Fred. Well, you made some good points. Yeah, I remember I have a lot of coffee, coffee, humor in my introduction. Spoke to a high school, sent my introduction, the person who’s going to introduce me and he said, I like your introduction, but they’ll never understand the coffee humor. So to your point, I took that out of there. But another thing I think is worth mentioning is that people have the attention span of a gnat. I mean instant coffee isn’t quick enough. So, you’ve got to break up that presentation with video, with interaction with sound, maybe with another speaker because to keep their attention is really, really tough. Ted Talks are 18 minutes or less. Apple introduced recently four newI Iphones. They had four speakers, ten minutes apiece. That was by design. Now when you most have people’s attention is right after humor because the ones who weren’t paying attention go, “Oh my gosh, I got pay attention. Everybody else is laughing and the ones who heard it say, “Oh I can’t wait till Chris makes the next joke. That was wonderful!” But keeping their attention appealing to different audiences. Those are excellent points, Chris. Thank you. And I gotta tell you, Fred. You are the guy, man. So if anybody’s out there and you’re having challenges with public speaking, if you want to become more confident in public speaking, this is the guy that you got to talk to. So Fred, if folks want to engage with you, what’s the best way they can do that? Best way is fred@nosweatpublicspeaking.com. Email me, I’ll get back to you. In fact, I’ll send you a free speakers template so you can start developing your own speaking opportunities and work on that signature presentation. And I gotta tell you, I mean it’s always awesome to come and visit with you and I guess I learn things every time we talk. And like I said, this is a skill. It’s like, it’s like, you know, working out in the gym, you’re trying to build your biceps and you’ve got to pick up this weight and you got to do the work and sometimes you got to pick up another way to do a different exercise. Well, when you get to talk with people that have experience in public speaking, it’s like picking up that or doing that other exercise and every time you come on, it always makes me feel good about being a speaker. And I always pick up something new from you and I’m going to sit in your class one day, Fred, you’re going to see me over there at the college in Saint Louis and I’m going to learn from you and I’m excited to do that. Chris, I learned from you today so I hope you do come to that class. That will be great! For everybody out there, I mean public speaking is the way to go and we should have like, they should have taught us this in high school. Maybe they did, but I wasn’t paying attention. Thank you for joining us. 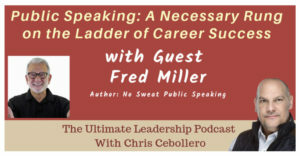 The Ultimate Leadership podcast is a production of Chris Cebellero.com You interact with us by email ultimateleadership sixteen@gmail.com. All rights reserved.